Like many aspects of your gap year, you will have no control over the weather. While you can easily pack an umbrella or sunscreen, what do you do in the event of real disaster? Natural disasters, while rare, do still occur, particularly in the geographically diverse regions you may visit. Earthquakes, floods, hurricanes, tornadoes, and tsunamis are but a few of the disasters that can occur. Knowing how to deal with disasters if they occur is vital to staying safe on your travels. Technically an earthquake is a vibration of the Earth caused by underground movement of a fault plane. For those above ground, this manifests as a violent shaking. If you are caught in an earthquake the best thing to do is stay outside, if possible, and away from buildings, poles or other objects that could fall. If you are inside, move away from windows and outside doors and take cover in an interior doorway or even under a table, make sure you stay away from bookcases, chandeliers or cabinets that could spill their contents. If you are travelling, stay inside your car or bus but ask the driver to pull over and turn off the engine. Stay away from bridges or tunnels. After the event, contact your embassy and loved ones at home. A flood occurs when a waterway rises higher than normal and spills over onto what would normally remain dry land. However a tsunamis is an ocean wave, or series of ocean waves, that are created by an undersea disturbance, although the first wave is not always the most severe. If you find yourself in either one of these situations you should listen for instructions/ orders from officials and evacuate when the order is given, if at all possible. Never walk through floodwater, even if it seems low, you do not know what is in the water, or how it will change. Consider removing any wet or heavy clothing if you can, as this will only way you down in the water. Move to the highest ground you can find, even if it is the roof of your building, in the case of tsunamis you need to be 25 feet above sea level so heading for the roof of a building is a good choice. Do not attempt to move downed power lines or other live electrical wires, as this will result in you being electrocuted. If you find yourself swept away by water, do not struggle. Never return to lower ground until authorities tell you it is safe to do so, when the authorities give the all clear you should contact your embassy and loved ones at home. 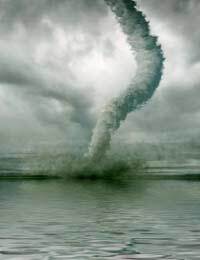 A hurricane is a severe tropical cyclone accompanied by heavy rains and strong winds, whereas a tornado is a windstorm that usually manifests as a tunnel-shaped cloud that reaches land. If you are caught in a hurricane or tornado you should evacuate when the order is given, if at all possible, always listen out for orders given by authorities. If you are caught outside, seek shelter as best you can and try to cover your head, if you can not find shelter lay flat on your stomach with your arms covering your head and neck. If you are inside when the hurricane or tornado hits, board up windows as best you can and stay away from any windows and doors. Move towards the basement of the building, or a ground level, interior room with few windows. The best thing to do if inside is to move to the opposite side of the building from the winds. A good tip to consider is to fill up a bathtub with water in case supplies are cut by the storm. If you are travelling during a tornado, insist that the vehicle stop, it is not possible to outrun a tornado, instead, seek shelter. As with floods and tsunamis do not attempt to move downed power lines or other live electrical wires. Hurricanes and tornadoes are storms and do usually cause flooding so as we said before if you find yourself swept away by water, do not struggle. Again once the authorities have given the all clear contact your embassy and loved ones at home. Natural disasters are never enjoyable events, but with just a little knowledge of how to stay safe, you greatly increase your odds of survival. Make sure you understand the geography, climate, and common weather patterns of the areas you plan to visit, and you just might save the day when faced with disaster.